Today I’m pleased to welcome Samantha Baldwin of Bromeliad as guest blogger. As she says, we’ve been blogging friends for quite some time, and I know that I can always find fresh ideas and beautiful images on her site. I think you’ll love these stealthy storage suggestions. 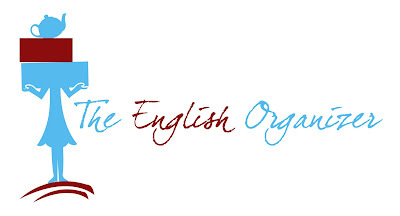 I’m honored to guest post at The English Organizer. I’ve known Pauline since she was “struggling to be stylish”, and to this day she is the only woman I know who organizes her wardrobe using Excel. My husband and I live in a 480-square-foot apartment. So I am always looking for new places to stash my stuff. Thus I introduce to you the concept of “stealth storage” – disguising your storage to look like decor. Above is a somewhat extreme example of this concept, the New York apartment of Linda Rodin featured in a recent issue of Matchbook, which reminds me of the Little Mermaid’s cave (“Look at this stuff. Isn’t it neat? Wouldn’t you say my collection’s complete?”), fun to visit but impossible for a minimalist like me to live with. Does Your Life Need a Defrag? Excuse me while I get all technical for a moment. As a computer hard disk nears capacity, it gets fragmented. That means, it starts to store bits and pieces of your files all over the place. Each time you want to access something, your computer has to go and retrieve it from various dusty corners and ‘glue’ your information back together again… which takes longer and is less efficient. Hence, savvy techie types do a periodic defrag of their computers, to get things running more smoothly again. Our modern lives are getting so fragmented, that similar things happen in your brain and your home. The analogy is pretty clear with space and storage: the more full up your house is with stuff, the more likely it is that you have fragments: items of the same type, but stored in many different locations. (Umbrellas? Flashlights? Sun cream, anyone?) The obvious solution here is to have a good sort out, de-clutter and then put things away, so that like is stored with like.